By 2013, Kirk J. Lewis had 22 years in automotive and steel businesses. He embraced a vital role in municipal government, serving as deputy mayor of Detroit from June 2011 through February 2013 — which is why everyone was surprised when he left sweet home Motor City for a new life in the Magnolia State. He was age 52 and chartering a new direction in automobile manufacturing. This is the world he knew, learned and grew with. Most of his career was spent with Ford, Toyota and the parts that assembled them. It still would be. In addition to automobiles and municipal service, his resume includes president of Integrated Supply Chain Solutions and accountant with Price Waterhouse. But now the direction pointed South, way south, to Blue Springs, Mississippi. Michigan wished him well. Indeed, Lewis looked forward to the private sector, but he also planned it. Before leaving Michigan, he entered into discussions with Toyota about a possible partnership with a new business. “We had discussed this for several years, ” he recalls about negotiations. “Toyota wanted new site locations and a warehouse/supplier/manufacturer to service it. We put together a deal where I could be a part of it.” His part was 51 percent ownership with Toyota Tsusho America Inc. owning 49 percent. Welcome to Mississippi. In March, 2013, the company president opened the business, named for the town it resides in, after a street he makes products for: Blue Springs Metals, Blue Springs, Mississippi, on Corolla Lane. Products include flat, hot and cold rolled steel, exposed and coated steel products and more. The firm uses leading technology in a factory that is ISO/TS certified, and it’s recognized by the National Minority Supplier Development Council as a minority-owned business. Suppliers are domestic and foreign steel mills. Customers are automotive and oil and gas industries. Much of Mississippi’s automobiles begin life in a 200, 000-square-foot facility, with about 65 employees. Blue Springs is a full-service steel processing center. About 95 percent of the business derives from one customer, but a really good one customer to have: Toyota. “We supply Corollas, ” adds Lewis. “We live or die by Toyota vehicle volume. If Corolla’s market is strong, so are we.” Like all business, the path is not always predictable. Toyota’s market drives on smooth trails and sometimes rocky roads. In addition to Toyota, much of the remaining five percent of sales derives from Nissan. Blue Springs annual total sales are $160 million annually from three main operations — slitting, blanking and warehousing. In blanking, coils — rolls of steel —are stamped into flat shaped steel, eventually becoming pieces for the body of Corolla. “For example, a ‘blank’ may be formed to look like a car hood when viewed from above, ” the company CEO says. “But it’s flat and usually sent off for stamping and adding dimension to form a real car hood.” The same goes for most other car parts. 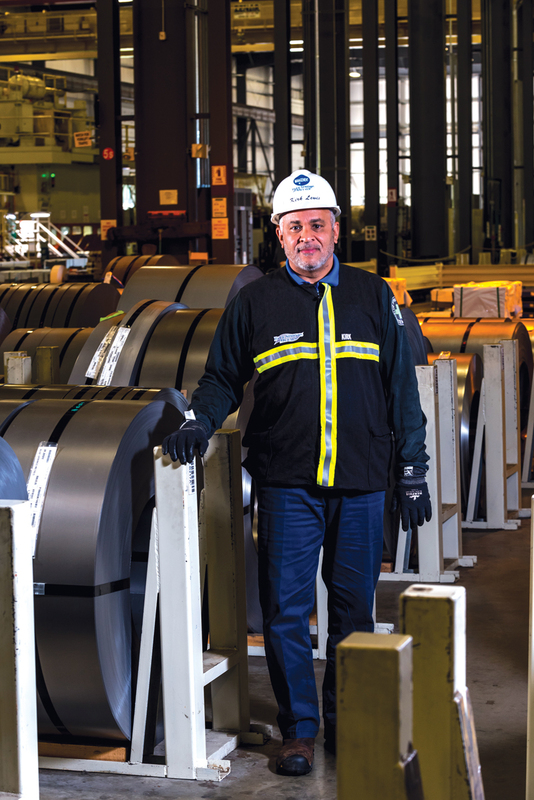 In warehousing, Blue Springs stores vast amounts of giant coils and other products in various stages of completion. It ships to both domestic and international customers. The company also offers products and services for the oil and gas industries. Offerings includes Oil Country Tubular Goods — manufacturing tubes used in oil and gas production, such as threading, couplings, heat-treatment, transportation, inventory management and technical support. Lewis is also president and CEO of Georgetown Metal Processing, a full-service inventory management, steel and aluminum processing facility in Georgetown, Kentucky. Both Blue Springs and Georgetown centers have similar processes, have the same type equipment, and often assist each other in jobs and production needs. He commutes a lot. Blue Springs has grown but has not changed. “We do the same things today as when I came here four years ago, ” he adds. “Our team is highly trained and jobs cover many disciplines, like warehouse workers, electricians, maintenance technicians and machine operators. A challenge for the company was finding skilled labor.” Back when Blue Springs started, automotive jobs common in Detroit were almost unknown in Mississippi. “When we got here, the car industry was not strong, ” says Lewis. “It was coming along, growing and evolving. In those days, furniture manufacturing was the big thing. As for the future, Blue Springs has capacity for expansion and looks ahead to the possibility of a new Toyota manufacturing center — at press time, still undecided and still an undisclosed location. “Usually, wherever the automobile plant site’s location is named, supply businesses soon follow at the same place or nearby, ” notes Lewis. He is confident that for Blue Springs, with a global customer base, “nearby” is within reach, wherever nearby is.